The Canadian Food Inspection Agency (CFIA) has updated its food recall warning issued on September 18, 2018 for Belleisle Foods Cole Slaw to include more product information. That product is being recalled for possible Listeria monocytogenes contamination. No illness reports have been received to date in connection with this recall. The product was sold in New Brunswick, Newfoundland and Labrador, Nova Scotia, and Prince Edward Island at the retail level. The CFIA’s food safety investigation identified this information. 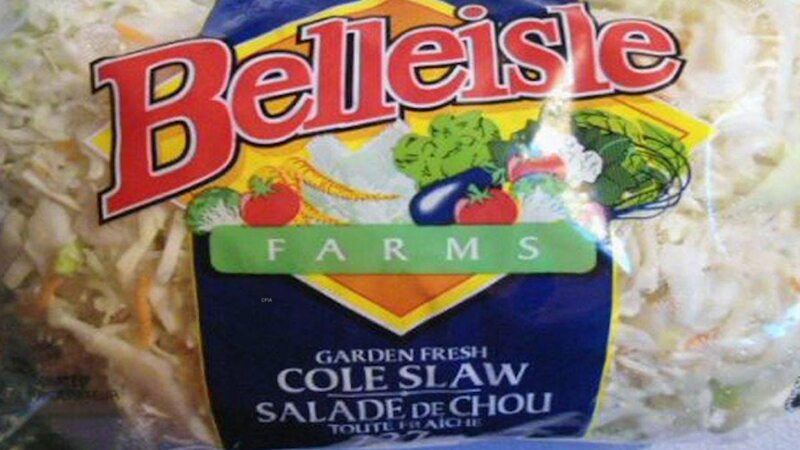 The recalled product is Belleisle Farms Cole Slaw in 227 gram packages. The code on the product is 18SE28, and the UPC number is 0 33383 65260 3. The company triggered this recall. If you purchased this product, don’t eat it. Discard it after wrapping it in foil or plastic wrap, and put it into a secure garbage can with a tight fitting lid so other people and animals can’t access it. You can also take the coleslaw back to the store where you bought it for a refund. It’s then a good idea to clean your refrigerator with a solution of 1 tablespoon liquid chlorine bleach to 1 gallon of warm water to kill any bacteria. Listeria monocytogenes bacteria can be persistent. It can grow at temperatures below 40°F, and freezing does not kill it. Wash your hands well with soap and water after touching this product and after cleaning. If you ate this coleslaw, watch yourself for the symptoms of listeriosis for the next 70 days. Those symptoms include high fever, stiff neck, severe headache, and diarrhea. Pregnant women are very vulnerable to this type of infection and can suffer miscarriage and stillbirth if they contract it. If you do get sick, see your doctor.